The five roles you can assign users on a blog are: Administrator; Editor; Author; Contributor; and Subscriber. There are two extra roles if you use My Class: teacher and student. You also need to consider carefully what role you assign other users since Administrators are able to remove other users, including you, and editors can delete content. When you set up My Class it adds two extra roles to your standard roles. All users you want to have access to and be able to manage all student blogs need to be assigned the role teacher — you select these users when setting up My Class. In the following example both Sue Waters and mohanjith would be assigned the role of teacher. They would be added as users to all student blogs and be able to access all student blogs using My Class > Student Blogs. Any one who has been added as an administrator is automatically listed as a user under the teacher option in My Class > Settings and can be assigned the role of teacher. You can update who, and how many, are assigned the role of teacher at any time by going to My Class > Settings, selecting the checkbox next to their usernames and clicking Save. The student role controls what your students can do on your class blog and on their student blogs. It is important that you keep all students assigned the role of student when using My Class. You change what students can do by the settings you have set in My Class > Settings. The student role allows students to change the theme, add/remove widgets and activate/deactivate plugins on their student blog only. 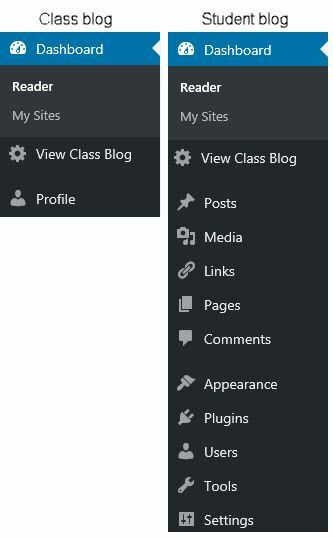 They can’t change themes, access widgets or plugins on the class blog. 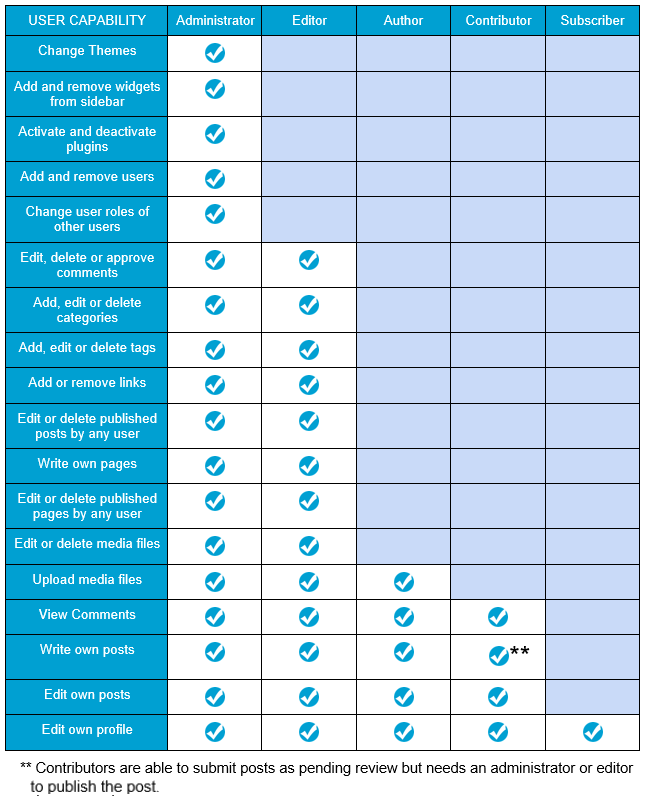 The student role’s ability to publish own posts and approve comments is controlled by the options you’ve selected in My Class Settings. In the following example the students can’t publish their own posts or comments. All posts are submitted as pending and must be approved by a teacher before they are published. 1. Go to My Sites dropdown menu in the admin bar. You need to consider carefully what role you assign other users when you have a group blog with more than one user publishing posts. Your administrator has complete access to all blog functionality including ability to change themes, delete the blog and remove users. We recommend you limit the number of administrators to one or two people and assign all other users a lower role. If you want them to be able to publish their own posts you would normally assign them the role of editor. If you want to review all posts before they are published you would assign them the role of contributor. 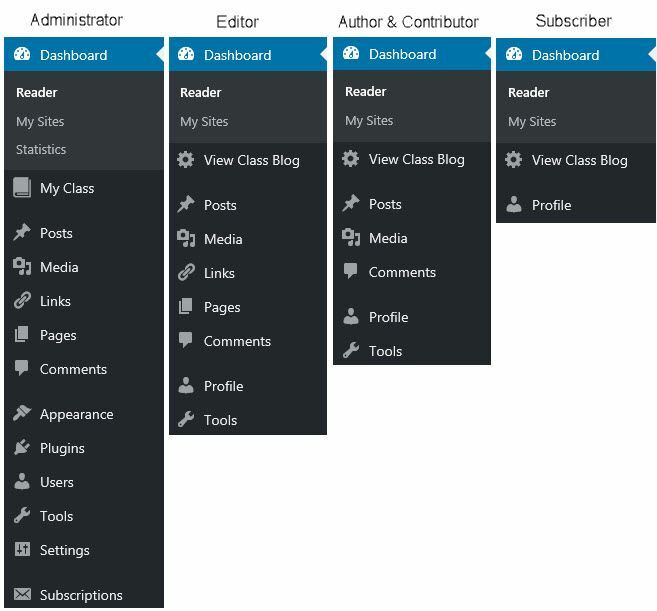 The best option on a class blog is to set up My Class if you have more than one person publishing posts on a class blog.